Bud Abbott and Lou Costello were one of the funniest and most-popular comedy teams of all time. Joining up in the early thirties to work in vaudeville houses, Abbott & Costello made their screen debut in 1940. "Buck Privates," "Hold That Ghost," `and "Ride 'Em Cowboy" were among their earliest hits. Later favorites included, "Abbott and Costello Meet Frankenstein," "Mexican Hayride," and "Lost in Alaska." 79 minutes DVD 1 - African Screams: In this 1949 comedy classic, Bud Abbott and Lou Costello travel to the Dark Continent in search of treasure and find more than they bargained for. Directed by Charles Barton one year after he helmed the great "Abbott and Costello Meet Frankenstein" "African Screams" costars a couple of Three Stooges favorites, Shemp Howard and Joe Besser. 82 minutes DVD 2 - Jack and the Beanstalk - This 1952 color classic might also have been called "Abbott and Costello Meet Mother Goose." In this comic retelling of the famous fairy tale, Lou trades the family cow for some of Bud's magic beans and winds up encountering a talking harp, a goose that lays golden eggs, and the fearsome giant who lives in the castle atop the fabled beanstalk. 114 minutes DVD 3 - Colgate Comedy Hour: In this complete 1952 episode of the classic comedy/variety series, Bud and Lou engage in some of their patented antics at the expense of Washington politicos. Also on board are Victor Borge with his delightful blend of music and comedy, and Allan Jones ("A Night at the Opera") singing his signature song, "Donkey Serenade." 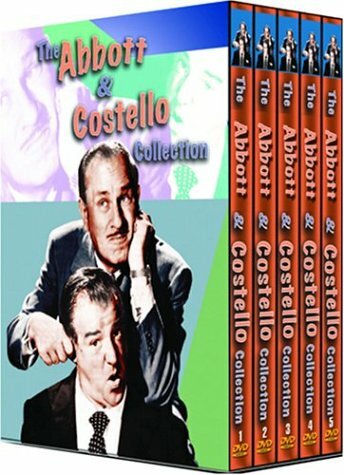 79 minutes DVD 4 - "HEY, ABBOTT": Host Milton Berle is joined by Steve Allen, Joe Besser and Phil Silvers in this 1978 salute to Abbott and Costello. This tribute features some of Bud and Lou’s funniest routines, a few of which were used by the comedy duo back during their starting out days in Burlesque and Vaudeville. Included are "The Shell Game," "Susquehanna Hat Company" and the classic "Who’s on First?" 45 minutes DVD 5 - A Tale of Two Kitties / Mail Call - Strictly G.I. / Abbott & Costello at the Movies: A compilation of Bud and Lou rareties. "A Tale of Two Kitties" is a 1942 cartoon featuring "Babbitt & Catstello" (get it?) and marks the first-ever appearance of Tweety bird (named "Orson" here). Also included is "Mail Call - Strictly G.I.," a wartime performance of their legendary "Who's On First?" routine, and as a bonus, "Abbott & Costello at the Movies," a collection of original theatrical trailers from many of Abbott and Costello's funniest films.